MIND Move into the Computer Age in Alton. The Alton team of MIND Alton & Bordon Wellbeing Service recently took possession of a radio enabled laptop donated by the Lions Club of Alton. MIND does not have premises in Alton and the laptop is essential in helping them provide support for people with mental health problems. The trained Advisors and Workers use it to help people access services such as online forums which offer support and advice on such things as eating disorders, general mental health problems, education and many other local or online only services. MIND provides help to those who are not getting the help or service they need. A referral isn’t necessary and they can be contacted direct. No one is turned away being told that they cannot be helped. A drop in group is held at The Salvation Army, Alton on Wednesdays from 10.00 a.m. – 1.00 p.m. until 9th May and from then on Thursdays at the same time. A session is also held at St. Mark’s Church Bordon on Mondays from 1.00 – 3.00 p.m.
Drop in groups are an easy way of making contact. A safe environment is provided where everyone is welcome to come for tea/coffee and cakes and to have a brief chat to see how they can be helped. One to one meetings can usually be arranged. The MIND Wellbeing Service can be contacted by calling Julie Terry-Jenner on 07909 921689, Anna Wall on 07765 636319 or the Havant office on 02392 498916. To find out more about Alton Lions call 0845 833 2701, email alton@lions.org.uk or visit www.altonlions.org.uk. 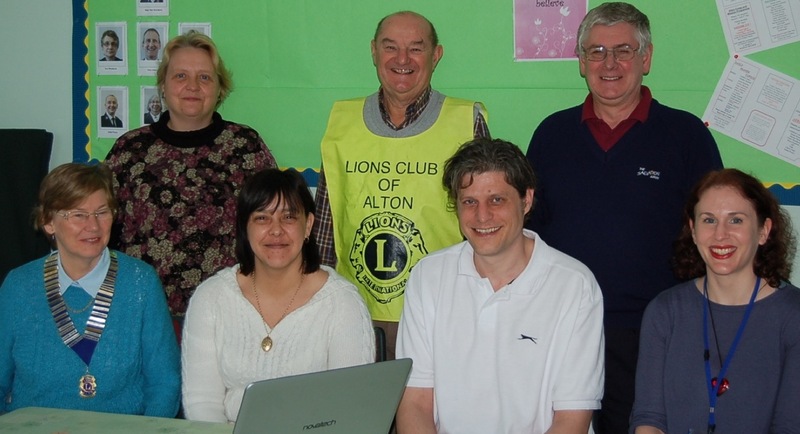 Photograph: The local MIND team receive the new laptop from Alton Lions at The Salvation Army HQ. Back row: Jane Hopkins, Wellbeing Worker; Mike Baker, Alton Lions; Major Neil Woollacott, CO the Salvation Army, Alton. Front row: Sarah O’Donoghue, President, Alton Lions; Julie Terry-Jenner, Wellbeing Advisor; Joe Clunes, Wellbeing Worker; Anna Wall, Wellbeing Advisor. Next Next post: Alton Community First Responders Meet the Public.